Our list of clients exceeds 20,000 organizations in more than 140 countries. 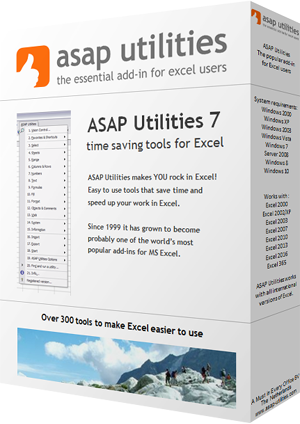 On average ASAP Utilities saves people 30.6 hours each year (measured among 103,778 users in March 2019). You can change the language to your preferred language at any time from within the application. Quick example of how the ordering system works and see what the invoice and license looks like. Which name is the license written out to? The name often is, but doesn't necessarily have to reflect the actual end-user. It is just a contact person for us within the organization and quite often it is someone from the IT- or finance department. If you prefer, you can also use a more general name such as the name of a department for the name. Determine the number of licenses you need. The licensing is per user. For example if you have 50 users that want to use ASAP Utilities you need to order 50 licenses (enter the quantity 50 on the order form). You will then get a license that is valid for this amount of users (in this example a 50-users license) and benefit from the volume discount. Fill in the requested information on the order form. If you purchase for someone else, for example a colleague or if you are a reseller, then uncheck the option: "The Recipient or Licensee is the same as the Purchaser" and enter the details of the end-user as the recipient information. The license is then sent to the email address entered in the "Recipient information" section, with a CC to the email address entered in the "Billing information" section. The invoice/receipt is (only) sent to the email address entered in the "Billing information" section. There are several online and offline payment methods to choose from, depending on your country and currency settings. If you choose to pay via credit card then please remember that the charge will appear on your bill from "DRI*ASAP UTILITIES" (from MyCommerce/Digital River). After you've placed your order you can download the legal receipt/invoice, and it is also sent to you via email as a PDF document. If you paid via credit card then please remember that the charge will appear on your bill with the description "DRI*ASAP UTILITIES" (from MyCommerce/Digital River). You receive the license by email within 5-30 minutes when you pay online such as with a credit-card. The license is sent immediately after your order is completed and the payment has been received and processed. It is an automated process. However, if you use one of the offline payment methods, such as check or bank/wire transfer, then it might take a little longer; you will receive your license as soon as your payment is received. For the time being you can then use our fully functional 90-day trial version, which we can even extend to 180 days upon request. Your order is processed by MyCommerce Share-it, authorized reseller of ASAP Utilities. For questions regarding your order or if you need help with the ordering system, please contact our vendor MyCommerce Share-it directly. 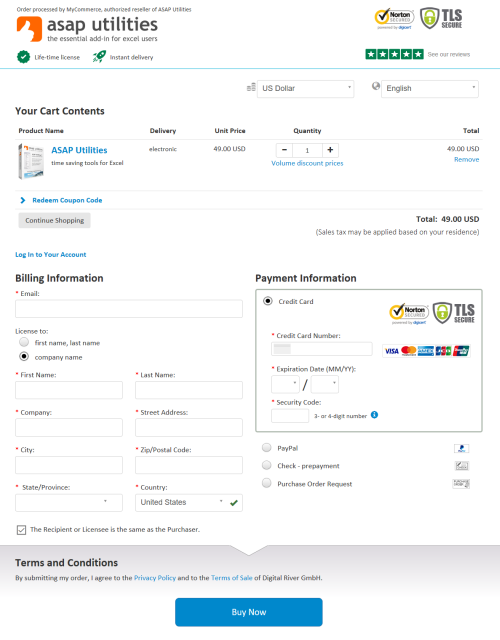 The MyCommerce Share-it Product ID for ASAP Utilities is 300779528.